Native advertising is one of the hottest topics on the marketing agenda right now, taking a new media platform (in terms of the history of marketing and advertising) and utilising its strength - the dissemination of relevant content – to its own advantage. Firstly, it is important to point out what we are classing as native advertising and how it came to be. The best way I can think of doing this is by looking at it like the chocolate chips in a cookie. The cookie represents an individual website that offers users a particular experience (for example Facebook, YouTube or even an online version of printed media) and the chocolate chips represent some appropriately placed advertising (this is advertising that follows the natural form and function of the webpage it is placed on). Or simply put; the chocolate chips don't look out of place in the cookie, although you know they have been placed there for a reason and can see as such and the cookie would be perfectly acceptable without them. Cookies aside, is native marketing a good way of engaging with an audience and how can it be successfully implemented? While monitoring the execution and modifying if necessary to achieve the desired goals. The primary objective here is making sure that the content the advertising sits alongside is relevant, so relevant in-fact that it doesn't look like advertising, which in itself can cause issues for both the advertiser (in making sure they are associated with the right type of content and paying for the privilege) and also the media owners (who run the risk of undermining the validity of their online content by intertwining covert adverts within this content). a handy little guide to where your sponsored content could be displayed by triplelift. And where does this leave the consumer, the most influential people in the entire process. They are the ones who will decide to click (sometimes inadvertently) or not click, believe or not believe, buy or not buy. 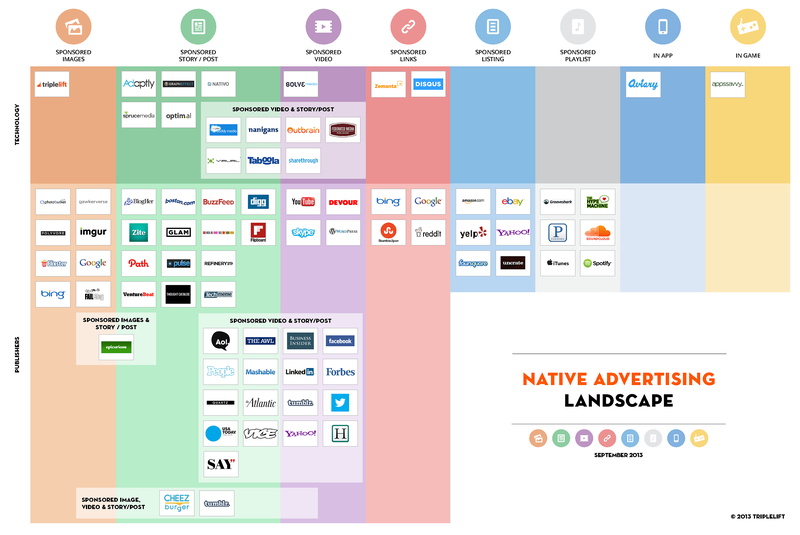 Native advertising is its own worst enemy in that really good native advertising bends into the content of the platform, so much so it might be missed or seen as part of the actual content rather than showing its true nature as a sponsored element. From an ethical point of view, is this deceitful? Trying to disguise an advert as content? Or is it clever marketing that consumers will appreciate as it is so closely linked to the nature and functions of both the content and platform consumers were searching for? However it is viewed one thing to remember is that this form of communication is based within a media that is still finding its place on the marketing calendar. Digital marketing is subject to change, instantaneous change as its media dictates it should be and native marketing is no different. It will change, it is changing and so will the rules and regulations as more technological advances are made. Just look at how much Facebook has changed since its conception. It is clear that working with a well-respected publisher will produce a very effective partnership as long as the advertising is relevant to the target audience, which is in the publishers’ best interest to do. Remember that the publisher wants the campaign to succeed as much as the advertiser does, so getting to understand their audience and how to ultilise a platform to your own advantage is key to generating a ROI. Imperative to this communication is making sure the audience of the publisher accepts your native advert as just that, an advert. If it is not made clear that this is the case an element of trust may be lost that can damage the reputation of both the publisher and the advertiser. Consumers may also insist on the continued integrity of the media channel they originally visited. Offering advertising that is relevant and authentic integrity will be kept and value will be added. Integration is key to successful native advertising. When this integration isn’t present the users experience is detrimentally changed with negative connotations for both the media owner and the advertiser as two very different identities try to blend in as one with little success changing a native advertising campaign into a hard hitting ‘click here’ advert. But as with all paid for communications there is a hefty charge for those advertising slots that hit the right tones with the audience you are looking to influence, working in partnership with the media owners to add value to their content which maintaining a level of integrity and value is what native advertising is looking to achieve and the successful campaigns have done this to great effect. Just like following a recipe, all the ingredients must work together, leave a good taste in the mouth, leaving the finished article pleasing to the eye… Or maybe I just really want a chocolate chip cookie! This blog was created by Pete Sumpton the very knowledgable Marketing Director for moocreations and a Digital Marketing Communications Tutor for Professional Academy. For more of his insights in to the world of Digital Marketing Communications follow moocreations on Twitter or download a prospectus for a Digital Marketing or Marketing Communications Qualification accredited by the CIM's CAM Foundation!